• Three-time Grammy-award-winner BRIAN SETZER’s new concert Blu-ray/CD, ROCKABILLY RIOT: OSAKA ROCKA! – LIVE IN JAPAN–filmed on February 18 at Namba Hatch in Osaka, Japan–is set for release November 4, 2016 via Surfdog Records. Live and loud, the concert encompasses songs from SETZER’s acclaimed 2014 studio album Rockabilly Riot! All Original—a sizzling rockabilly album from start to finish featuring SETZER’s trademark twang and fretboard fire. 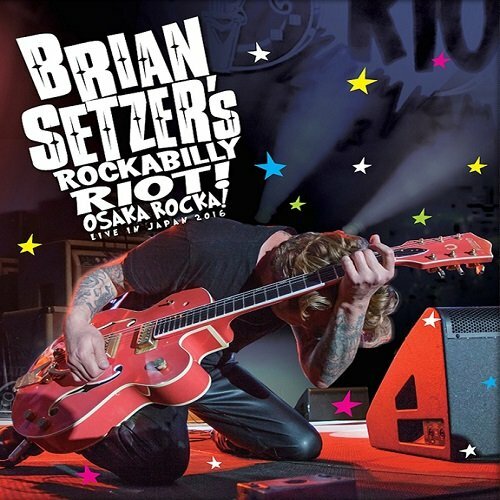 Also included are classic hits from his Stray Cats days, Brian Setzer Orchestra tunes and tracks from his solo albums. In front of the wildly enthusiastic audience, Brian Setzer and his band—Noah Levy (Drums), Kevin McKendree (Piano and Guitar) and Mark Winchester (Bass)—are firing on all cylinders.